If you're looking for IT support, the first question to ask is what type of support does your business need — full coverage or per issue? In other words, should you choose a managed service provider (MSP) or a break/fix? MSPs are companies that provide end-to-end IT support. In a true MSP partnership, you have a dedicated team of IT specialists that works to improve your IT environment now and into the future. Break/fixes offer a more one-track service. As the name implies, when something breaks, they fix it. Both models can work, but when the average company spends close to 4% of revenue on IT , it's important to know exactly what you're getting. 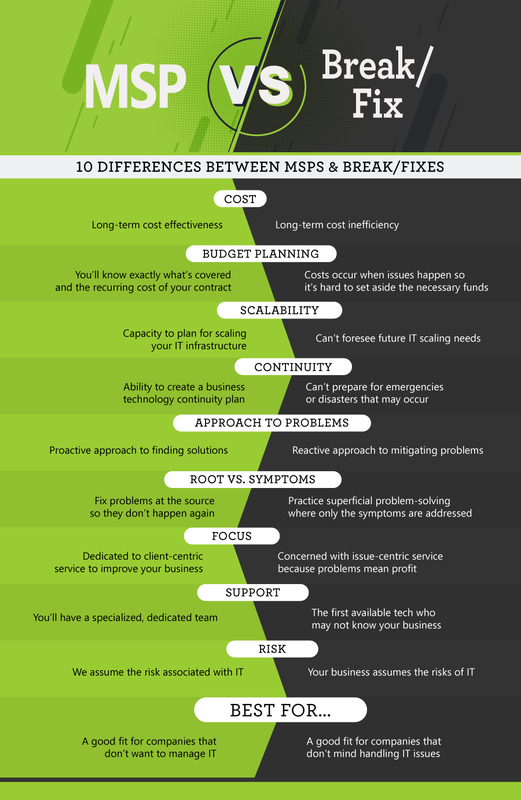 These top 10 differences between MSPs and break/fixes will help you make the right choice. There's a reason 59% of IT services have transitioned from the traditional break-fix model to a managed service contract. For many business, MSPs are the right way to go, but that doesn't mean break/fixes are dead yet. If your business has enough IT personnel in-house, enough extra capital to build a large contingency fund and enough time to expend on IT issues, a break/fix might be right for you. Ultimately, your decision depends on your company's IT resources, needs and goals. Made your decision? We'll help you make the next one. iVenture Solutions is an award-winning managed service provider delivering superior IT solutions to clients across Florida. As a leading-edge IT firm for small and medium-sized businesses, we provide a diverse range of services covering the entire scope of IT including maintenance, support, hosting and more. Through rapid response time, reduction of chaos and the right people, our expert team of IT professionals will fulfill your technology needs. At iVenture, we give you more time to do what matters most.